There are times when you just want to do something a bit different from everything else. It may be that you have a kit with the unit you like, but you want a different plane. When it comes to Luftwaffe fighters, often times that means little more than a different aircraft number. FCM has produced a sheet that will provide you with just that. 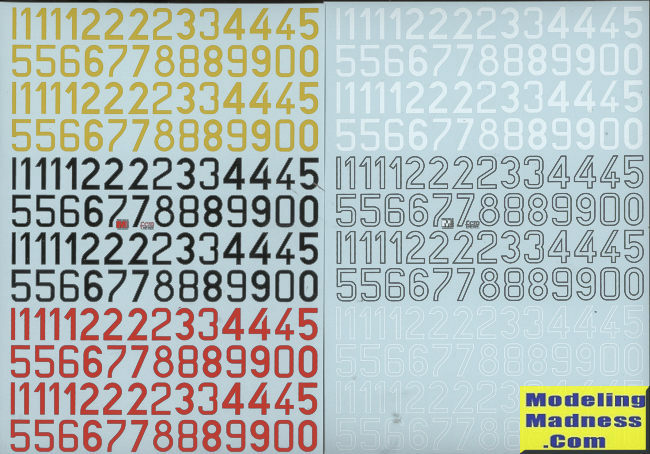 This set provides aircraft numbers in a variety of fonts and in the four major staffel colors that were used. Sure, there were times when green, brown and blue were used, but for the most part these are the main colors. The set also provides outlines in both black and white for those cases when it was used. One simply adds the outline first, and once dry, one applies the number over it. The decals are superbly printed by Microscale so you know the quality is there. There are a number of places that sell FCM decals, so check the web for your nearest dealer.